I always take you guys’ suggestions to heart when you email me all giddy about a band you’ve just seen or stumbled across. 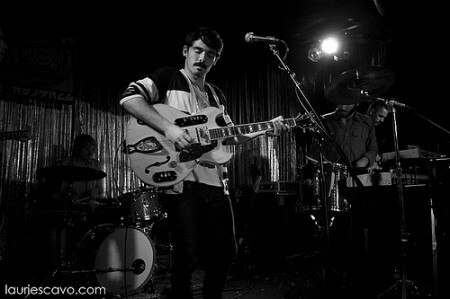 So when three readers in one week emailed me about Silver Lake band Local Natives, I made sure to pay attention. I haven’t had the privilege of seeing them live yet, but all three who wrote had just done precisely that, and raved about their energy and melody. Me, I love the clattery percussion and the summery sound. They boast “the charisma to tempt even the most despondent hipsters and shy concertgoers into dance machines,” which we can all admit the world needs more of. I really super-dig the song “World News,” you can stream that one on their MySpace, and they have the Sun Hands single due out next week (hear that one here). UPDATE: Holy mackerel. I was already planning to post this today and Matt Picasso just tripled my joy. Ahh, that felt so good. Tagged with laurie scavo, local natives. Is it okay to like this more than the original? Okay, that was just a fabulous video. I now have to go listen to all of their music, based solely on that cover. Thanks as always. Wow. I really like this! Almost more fun than you can pack into one YT vid! I have a tremendous urge to grab some stick and “play the tree”. Loved it! Yeah, I gotta see these guys. Thanks, Heather, you always pass along the best stuff! Thanks! I’m really enjoying these guys. They are doing a couple of shows in London next week, so I think I’ll go check them out. as i said, they are my favorite LA band. thanks for swiping my image.